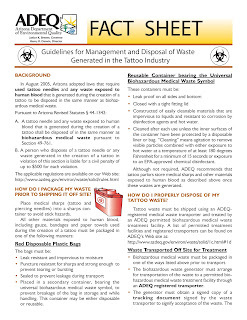 In August 2005, Arizona adopted laws that require tattoo shops to adhere to specific guidelines for disposing of needles and other bio waste associated with the tattooing process. Most shops were not aware of these laws and therefore, have not been following these guidelines. 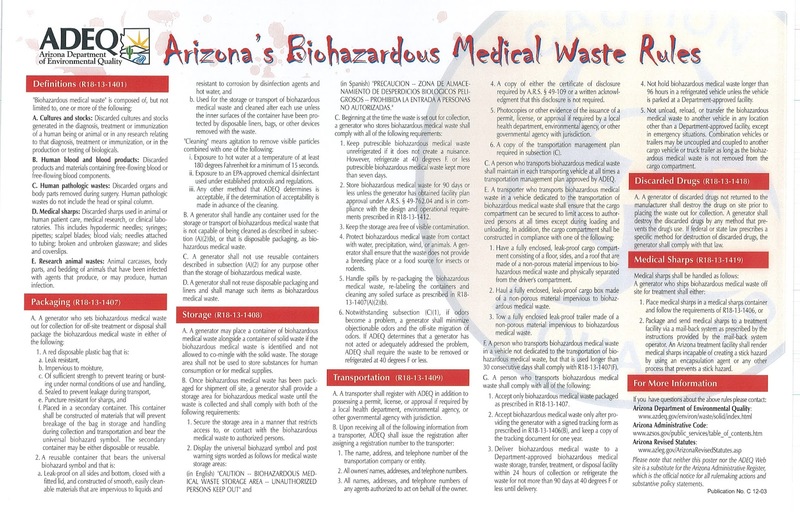 Arizona Department of Environmental Quality has began to enforce these laws beginning in February 2016. We encourage all tattoo artists, especially shop owners to familiarize yourself with these laws to avoid failing an inspection. Each violation could make you liable for up to $500. ADEQ will be performing random inspections beginning in February 2016 so make sure you're shop is following the guidelines. 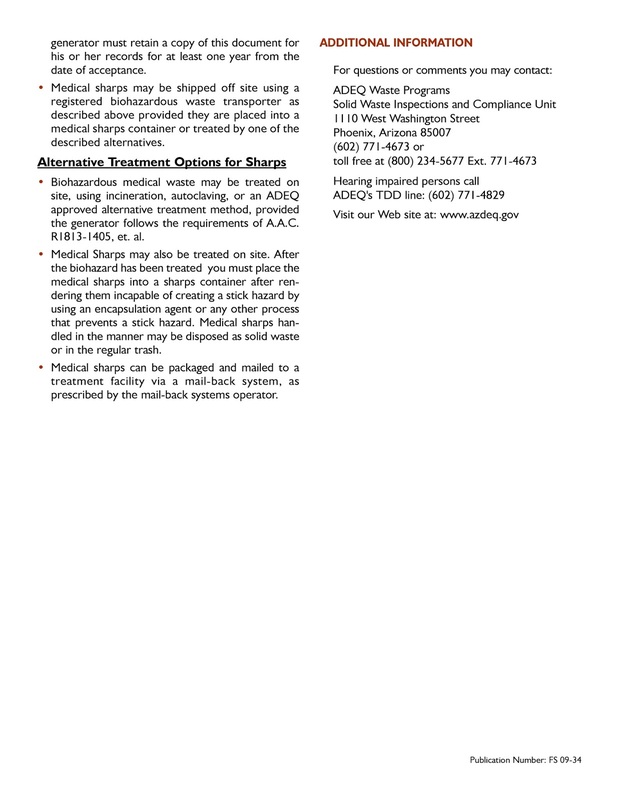 There are several options available for waste disposal outlined above. If you're interested in contracting a licensed transporter to pick up your waste, here's a list of companies below. 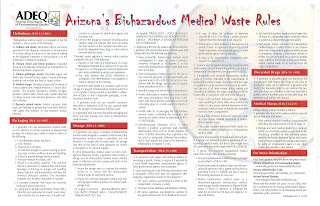 Healthcare Medical Waste Services, Inc.
Pet & Animal Lovers Services, Inc.
We have this information available at our Goodyear, AZ location upon request. Be safe, be responsible, follow the guidelines. 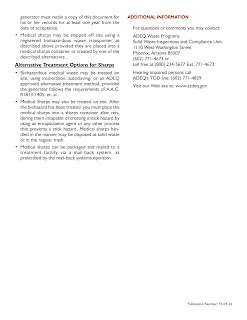 We no longer offer sharps and waste disposal at our location(s). If you dropped off your waste at Needle Supply, this option is no longer available as of March 1, 2016. You already know how dedicated we are to selling tattoo supplies of the very highest quality. Our customers are ink professionals themselves, and they've come to expect nothing but the finest when they order inks and accessories from us. Our reputation is as brilliant as the inks we stock, sell and ship. As of May 2014 we are pleased to present a new addition to our catalog of world class tattoo supplies and accessories. If you're in the tattoo industry as an artist or as an aficionado of fabulous body art, you've surely heard the buzz about Eternal Tattoo Ink. Eternal makes every color ink imaginable, and every shade of gray, as well. We're proud to be adding the full range of Eternal tattoo ink to our online store. A great artist can only be as good as their tools and supplies. The way we see it, it's worth spending a little extra for super high quality ink products. Ink is, after all, injected under the skin when a tattoo is applied, so using the best ink possible just makes good sense. We're proud to announce that we now sell the full line of professional tattoo ink Alla Prima. A good quality tattoo ink is essential for great looking tattoos. High quality tattoo ink is vital when creating professional, bright, long lasting colorful tattoos. A quality tattoo ink provides a tattoo artist with a great tool to create beautiful tattoos that last a lifetime. Tattoo artists who begin using Alla Prima tattoo ink will notice how easy the ink flows into the skin and how well it heals. The tattoos created will glow with more radiance. A good tattoo ink is made with the best pigments. Alla Prima is made with pre-dispersed powder pigments that are selected for their pure, intense, deep and clean attributes. In addition to using the best powder pigment, the creators gave extra attention to the blend of carriers selected to deliver the pigment into the skin. 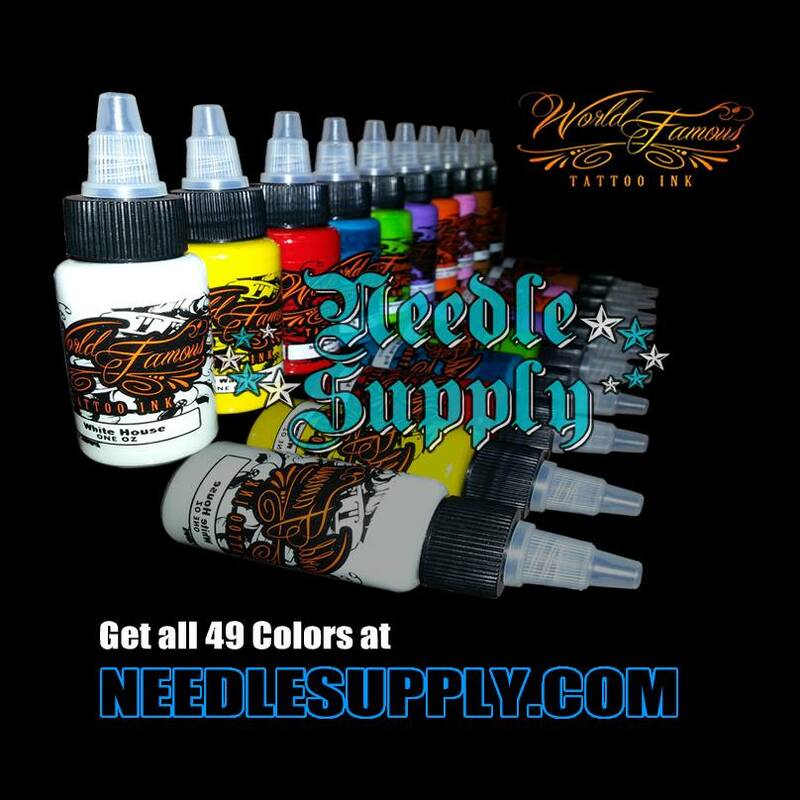 In an effort to assist local tattoo shops and tattoo artists throughout Arizona, Needle Supply Company Tattoo Supplies is now providing sharps medical waste disposal. Tattoo artists can drop off sharps containers at our Goodyear location and we will dispose of the medical waste properly. 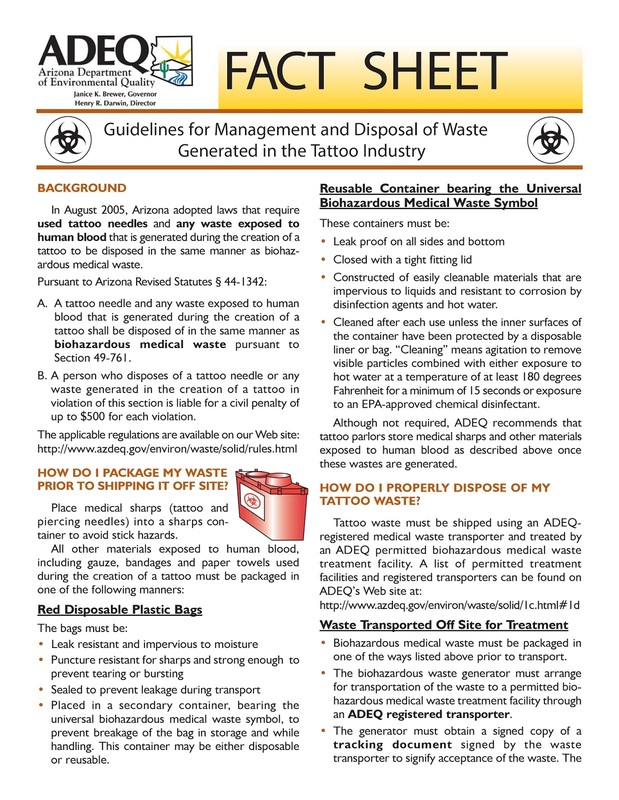 We are offering this service at a minimal cost to promote safe and responsible waste disposal by local tattoo artists and shop owners. This service is not limited to tattoo artists and tattoo shops, anyone in need of sharps container disposal in Phoenix, Goodyear, Avondale, Tolleson, Glendale, Mesa, Sun City, Peoria and all other local Arizona cities is welcome to drop off their containers at our location. Should you have to wait 24 hours to get a tattoo? That’s the question being raised by health regulators in Washington, DC. Officials are considering a mandatory 24 hour waiting period before getting a tattoo or body piercing in our nations capitol. The owner or licensee of tattoo shops located in Washington, DC will have to ensure that no tattoos or piercings will be performed until a mandatory twenty-four hour waiting period has passed since the customer initiated contact with the establishment if the proposed regulation becomes law. If passed, say goodbye to the days of walking into a tattoo shop and walking out with a tattoo or body piercing. Such regulation could be detrimental because tattooists rely heavily on walk-in business. Tattoo shops receive 40-70% of their revenue from walk-in customers that want that spontaneous tattoo or piercing. Furthermore, tattoo expos would be a thing of the past if this becomes law. Officials are citing health risks and buyers remorse as the basis for the proposed regulation. They believe this will prevent people from making a bad impulse decision and allow them 24 hours to think it over. Most tattoo professionals won't tattoo any individual that is underage, intoxicated or indicates that they're not committed to the tattoo. Do we need the government protecting us from getting a tattoo or piercing that we may regret? In June, we proudly added World Famous Tattoo Ink to our growing list of tattoo supplies offered. These tattoo inks are rapidly becoming the preferred choice of pigment among some of the best tattoo artists around the globe. Currently, there are 49 brilliant colors to choose from which are available in many tattoo ink sets or by individual bottle. The manufacturer has added some great features such as safety sealed bottles and tamper proof labels to ensure authenticity and quality. We're very excited to announce the opening of our newest tattoo supplies retail store located at 2744 W McDowell Rd in Phoenix Arizona! After weeks of hard work by our dedicated staff, we are ready to open the doors to our third retail location in Arizona. If you're in Arizona, we hope to see you there. 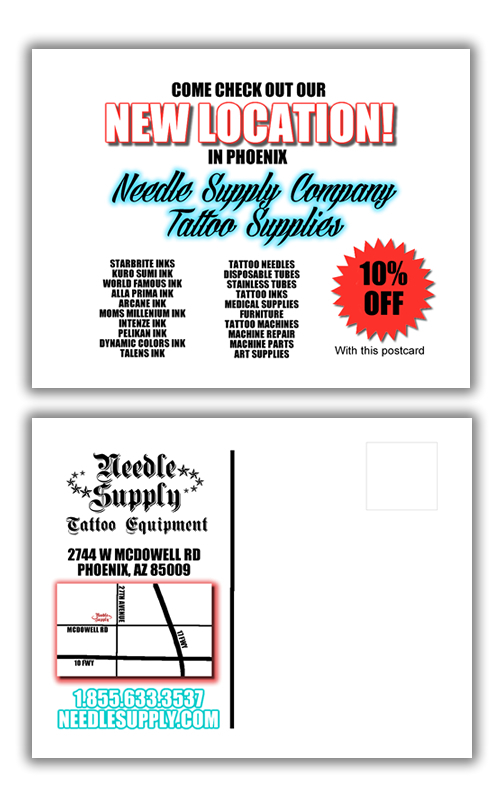 Phoenix, AZ, June 17, 2013– Needle Supply Company Tattoo Supplies, an established provider of tattoo supplies, tattoo shop equipment and medical supplies recently announced the addition of two new Arizona locations. The newest location in Phoenix was strategically located to provide high quality tattoo supplies to the large number of tattoo artists in the central Phoenix area. Many tattoo artists and tattoo shop owners have expressed their appreciation for the new location as it will save them a trip to the original location in Goodyear. 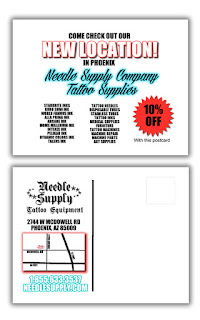 In addition to the new Phoenix location, Needle Supply has a third location in Guadalupe that services the surrounding Tempe, Mesa, South Phoenix, Chandler, Apache Junction, Gilbert, Ahwatukee and Queen Creek areas. This retail location will offer a full line of tattoo supplies including tattoo needles, tattoo inks, tattoo machines, tattoo machine repair, medical supplies, tattoo disposables, stencil and art supplies and tattoo furniture. Postcards announcing the new location (pictured below) were circulated to all of the tattoo artists and tattoo shops prior to the grand opening. We're offering a 10 percent discount to customers that present the postcard. ©Copyright 2014 Needle Supply Company®. Simple theme. Powered by Blogger.